I had a short but very fun stargazing session tonight. I went to the top of the parking garage in downtown Claremont to look for Comet PanSTARRS. I knew that it would be horizonwards and a little right of the moon. I took the Apex 127/SV50 combo and my 15×70 binoculars. I got set up a little after 7:15 PM and started scanning the western sky, using the 15x70s and SV50 in alternation. 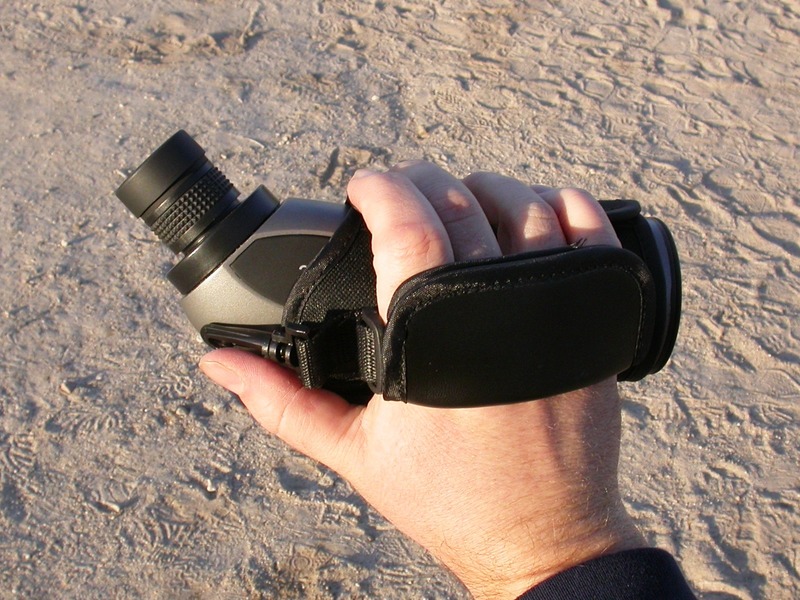 Binoculars are pretty much guaranteed to be the best instrument for first picking up the comet, but it is big and bright enough to be a very rewarding telescopic target, and if you only see it in binoculars, you will definitely be missing out. Here’s a little trick for getting it in the scope: once you have it in the binoculars, scan straight down to the horizon–which ain’t far–and find a landmark. Go back up and relocate the comet, then back down again to make sure you’ve got the right landmark (I didn’t, the first time–I’d let the bins drift too much to the right on the way down). Anyway, once you’ve got the landmark, you’re golden: point the scope at the landmark and scan up to find the comet. At 64x in the Apex 127, the nucleus seemed to be an extended object, not just a point of light. The tail swept straight up. I thought it was a little brighter and a little crisper on the north (right side in the sky, but left side in the scope). I wish I had sketched it–I’ll do that next time out. Just a few minutes after I got the comet in my sights, a young couple pulled up and parked nearby, and invited them over to see the comet and the thin crescent moon. When the young woman saw the moon in the scope, she jerked back from the eyepiece, shook her hands, and said that the view had given her the chills. When people ask why I do sidewalk astronomy, I tell them about things like that. Later on a family of five pulled up and I showed all of them the comet and the moon. So I had an astronomy outreach to a total of seven guests tonight. My favorite part: helping a 6-year-old kid get the 15x70s balanced on the side rail of the parking garage so he could see the moon. If you’d like to see the comet, your best chances are in the next week or two. It will probably be bright enough to see with a telescope for weeks after that, maybe even months, but it isn’t going to get any brighter. Get over to Sky&Tel or just google “comet PanSTARRS”–the internet is falling over itself giving out instructions on how to find the comet right now. By 7:50 all my visitors had moved on and so had the comet, lost in the hazy clouds over Los Angeles. I wasn’t done, though. As I’m sure I’ve mentioned here before, I’m closing in on finishing two of the Astronomical League’s observing programs, the Urban Observing Club and the Double Star Club. If I’d gotten my rear in gear a month ago I could have finished them both easily by now, but my head was stuck in the Jurassic and I let too much time slip by. As of a couple of days ago, I only needed two more objects for each club: M77 and Algol for the Urban Club, and Alpha Piscium and 8 Lacertae for the Double Star Club. The trouble is, they’re all low in the western sky now, and in a month or two they’ll be right behind the sun. So if I don’t get them pronto, I’ll have to wait a while before I’ll get another crack at them. I got M77 Monday night from my driveway. I’d also seen it Saturday night on my Messier Marathon, of course, but that didn’t count; to be eligible for the Urban Club, the observations have to made from someplace sufficiently light-polluted that the Milky Way is not naked-eye visible. Fortunately this galaxy has a crazy-bright core and I caught it with averted vision from the driveway even though it wasn’t fully dark yet. My time limit was set less by the sky and more by local geography: when I saw it, it was already in between the leafless branches of one of the trees in my back yard. Algol is up in Perseus, still a good 25 or 30 degrees above the horizon at sunset, so it’s easy enough to see. That ain’t the problem. It’s the only variable star on the Urban Observing list, so I reckon I haven’t fulfilled the spirit of the thing until I’ve seen it go through one of its periodic brightness variations. These happen about every three days, which sounds great, except that they’re offset so most of them happen during the day, or when the constellation has already set. I need one of those minima to hit between about 7:00 and 9:00 PM, which is a pretty darned narrow window (why oh why didn’t I just see this thing a month ago?). I just missed one on March 7, when my head was still only in the Jurassic. The next one that is in my time window is on the evening of March 27, when I’m scheduled to be on an airplane between Texas and SoCal. The next good one after that isn’t until April 16. That one may just be doable–Perseus is far enough north that it sets pretty late from my latitude (from 40 degrees and points farther north, it doesn’t set at all). I have been kicking and kicking myself for not getting Alpha Piscium and 8 Lacertae in the past few months when they were dead overhead. I actually got Alpha Piscium in they eyepiece one night a week or two ago, but I couldn’t split it before it got lost in the trees. I found out why tonight: it’s a darned hard split. After the comet and all my visitors had departed, I went straight to Alpha Piscium. It was already down into the near-horizon murk, which makes stars take on interesting shapes and colors that often have nothing to do with their normal night-sky appearances. At 64x it was just a dot. Same thing at 128x. Same thing at 257x, at least at first glance. But then the seeing steadied for a crucial moment and I was able to get the focus dialed in, and there it was: a double star. At high magnification in the Mak, each star is surrounded by a neat little diffraction ring. At 257x, Alpha Piscium’s secondary component was sitting on the diffraction ring of the brighter primary, as if the primary was sitting in the middle of a diamond ring. Like this, only I couldn’t see the diffraction ring around the secondary star so clearly. Anyway, it was a pretty sight and a righteous split. That left me in the same place in the Double Star Club that I am in the Urban Club: 99 down, one to go. I thought that 8 Lacertae might just be possible, so I started star-hopping over that way. I almost got there, too, but just in time to see the lizard’s tail dip below the local horizon. I am pretty sure that if I try again in the next couple of nights, and go to 8 Lacertae before I do anything else, I’ll be able to get it. It’s a nice wide multiple star, so it shouldn’t be a tough split, if I can just get on target before it sets. Finally, I’d be remiss if I didn’t point this out: Orion has put their 20×50 compact spotting scope on clearance for $29.99. You can get it through the Orion site or this Amazon link . I am familiar with this scope–London and I gave it a test drive at the Orion store in Watsonville last summer, and on the strength of that encounter London asked for and received one for his birthday last November. 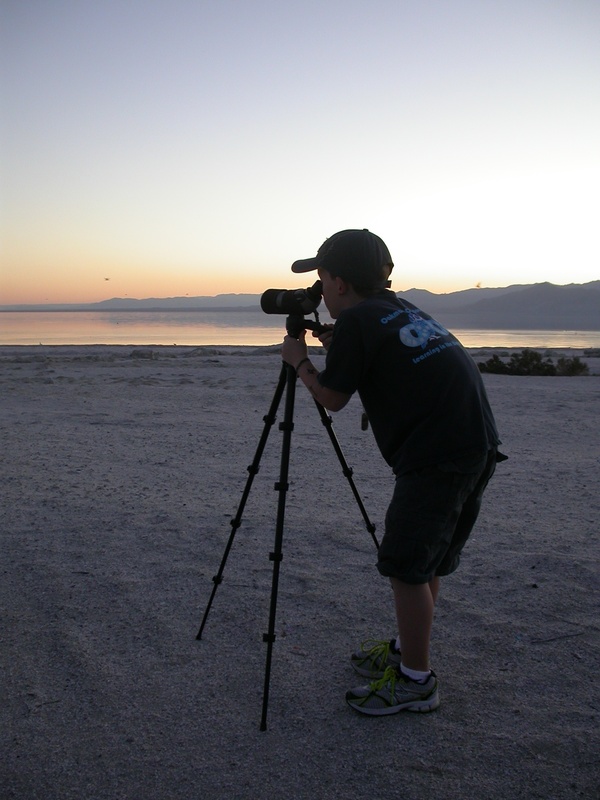 We’ve had it out to the Salton Sea a couple of times now, so we’ve gotten to use it for daytime spotting and out under the stars. How does it do? Well, it’s a 50mm spotting scope, and like most such devices, it basically is a finderscope and has no other finder or provision for one. Also, you’re stuck at 20x. So for nighttime use, you’re going to get binocular-esque views of the moon, planets, and a handful of the brighter DSOs (think Pleiades, Orion, Andromeda) and that’s about it. Also, it’s a short, fast refractor, so there is some false color on bright objects. To be fair, though, almost all spotting scopes are short, fast refractors (‘cept for the Maks), and other than the ED models that cost hundreds to thousands, they all show chromatic aberration. Even my beloved SV50 throws up some false color, and I don’t think the Orion spotter is noticeably worse in this regard. It’s much more rewarding to use during the daytime. I don’t know why Orion is closing them out, but it probably isn’t image quality, because the two I’ve looked through have been nice and sharp. In addition to the zippered soft-side storage case, the scope comes with a velcro-tabbed, padded fabric wrap-around, similar to the weather-resistant ‘view-through’ cases on some high-end spotters (but offering less than total coverage). This has a padded hand-strap so you can take the scope off a tripod (not included, nor would you want any tripod they could include at this price point–trust me) and use it handheld. This is surprisingly effective, and London and I have taken to carrying his scope along on our morning hikes when we’re camping. Any downsides, aside from the aforementioned false color? The helical focuser was a little stiff for the first few uses. The usual solution with sticky focusers is to twist them all the way in and out a few times to get the lubricant evenly distributed over all the surfaces. I did that with London’s spotting scope and sure enough, the problem went away. Focusing is a breeze now. 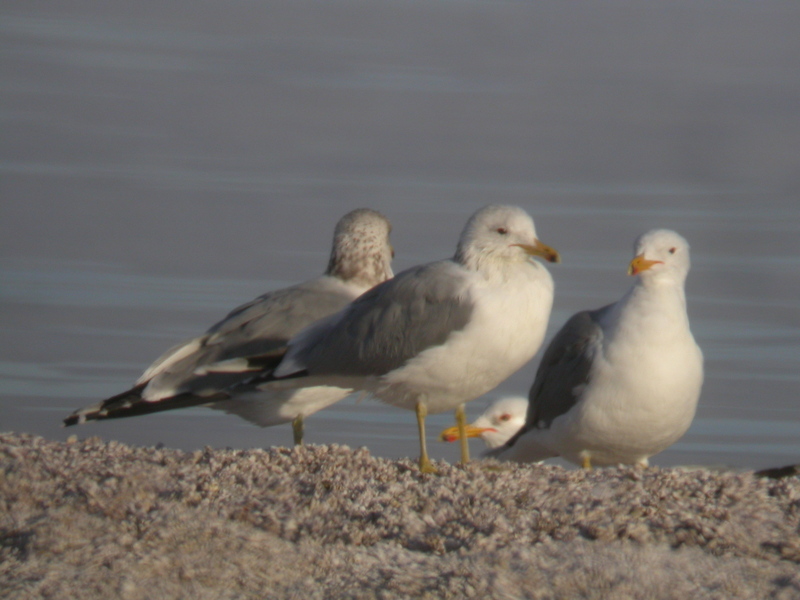 Raw, unmodified photo of some gulls at about 50 yards, taken afocally through the Orion 20×50 compact spotting scope using my Nikon Coolpix 4500. So, long story short, I dunno why Orion is closing these out, because I think they’re fine little scopes. I haven’t noticed any lasting problems in several days and nights of field use, and if I didn’t already have a 50mm scope of my own, I’d be all over this. It’s a decent buy at $50 and a steal at $30. If you need a small spotting scope, period, or something to keep in the car for impromptu scenery- or wildlife-watching sessions, or something for that kid you know who is interested in nature and science, this thing ought to fill the bill. I’m tempted to get another one myself, to keep in the storage compartment under the back seat of the Mazda. But if you’re interested, don’t tarry–Orion is already out of the spotting-scope-plus-tripod packages, and I don’t imagine the scopes themselves will last long at this price. Afocal shot with Nikon Coolpix 4500 shooting through SkyWatcher 90mm Mak and Orion Sirius 32mm Plossl eyepiece, tweaked and flipped to correct orientation in GIMP. 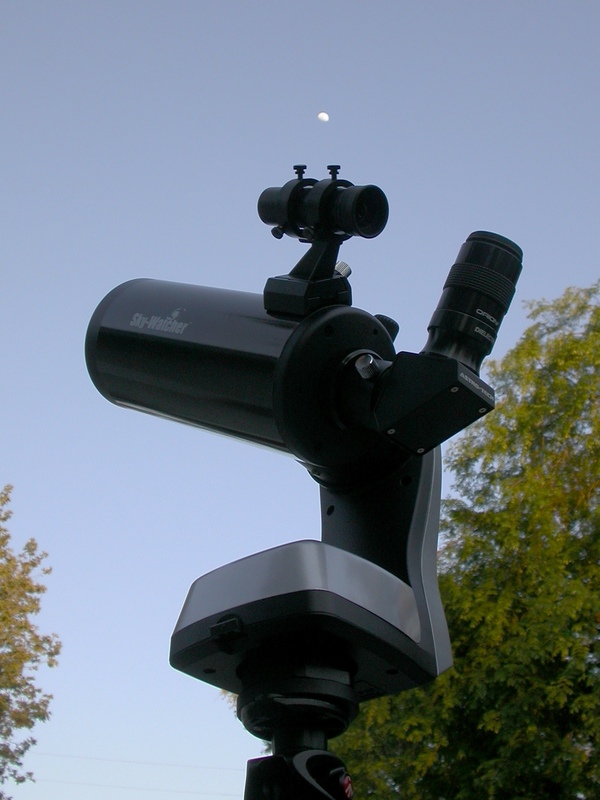 Eight-seven people saw the moon through this telescope tonight. Thanks to everyone who has commented on the Suburban Messier Project. I will go forward with it at some point, but right now I am in the middle of my summer teaching and don’t have time for much of anything other than that. See you in the future! 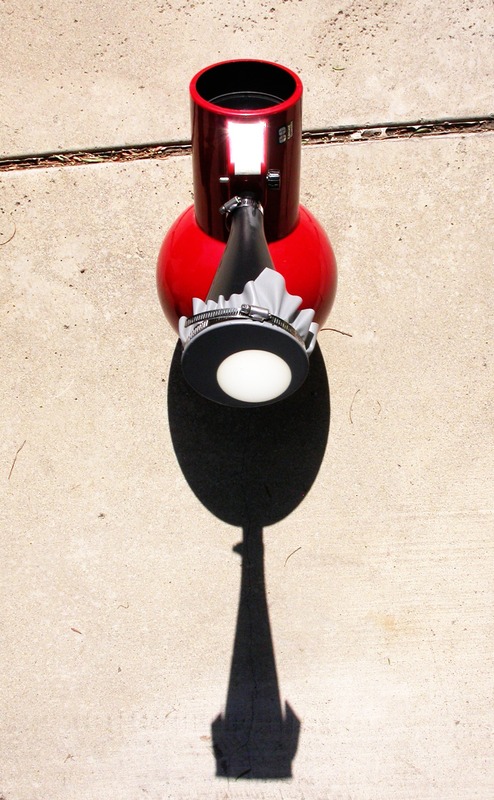 In preparation for the transit of Venus tomorrow, I did a little hacking and tinkering late this afternoon. Although the sun funnel worked well enough for watching the eclipse, as we’ll see below it is not perfect for photographing the sun in any detail. 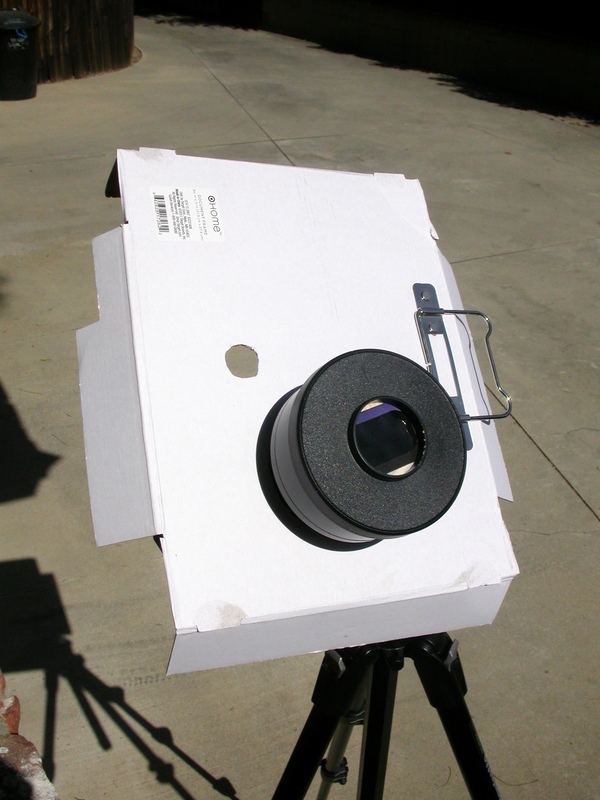 My full-aperture solar filter still hasn’t arrived, but I got to thinking about how to make a safe direct viewing setup. I recently acquired a Celestron Travel Scope 70, a little 70mm (2.75 inch) f/5.7 achromatic refractor. Like a lot of small refractors, the dust cap for the objective lens has a smaller removable cap in the middle, in case you want to stop down the scope for more pleasant viewing of bright targets like the full moon. The diameter of the small hole in the middle of the big cap is 40mm, so with big cap on but the small cap off, the scope functions as a 40mm f/10. I don’t have any loose solar film to make a 70mm solar filter or even a 40mm solar filter. But I do have a stack of eclipse glasses, each of which has two 1×1.5 inch eye holes covered with solar film. So I cut one of the eclipse glasses in half, made a round 25mm aperture in a square piece of cardboard, and mounted the eclipse glasses ‘lens’ (solar film still surrounded by two sheets of thin cardboard) and the 25mm aperture stop on the back side of the big dust cap. I didn’t think to take any pictures of the inside of the dust cap to show how it all goes together, but hopefully the general idea is clear enough. With the big dust cap on and the small dust cap off, the scope admits a 25mm beam of fully solar-filtered light to the objective, turning the scope into a 25mm f/16 solar refractor. And because the solar filter is on the inside of the big dust cap and protected by the small dust cap (in front) and the second piece of cardboard with the 25mm aperture stop (behind), I can leave it in all the time. Take the big dust cap off, the scope functions normally. Take only the small one off, I’ve got a 1-inch solar scope. Two other design decisions to note. First, the finder–and I use the term advisedly–that came with this scope is without doubt the worst finder I have ever seen on a commercial scope from a brand name manufacturer. It looks like a 5×20 straight-through magnifying finder. However, right behind the (single, plastic) objective lens is an aperture stop with only a 1-cm hole in the middle. So in fact it’s a 5×10 finder with a plastic singlet objective. The immense irony is that the scope doesn’t need a finder at all; throw in a 32mm Plossl and you get 12.5x and 4-degree true field of view, so the scope effectively functions as its own superfinder. So I unscrewed both ends of the finder and dumped out all the plastic optics, turning it into a hollow sight tube. Why is this important right now? Because it’s really dumb to leave a magnifying finder on a telescope being used for solar observing; it’s too easy to forget what you’re doing and accidentally looking through the unfiltered finder and cause serious eye damage or blindness. There’s a good reason that every commercial telescope comes with a “don’t point the scope at the sun, dummy” tag or sticker or both. This is not something to mess around with. 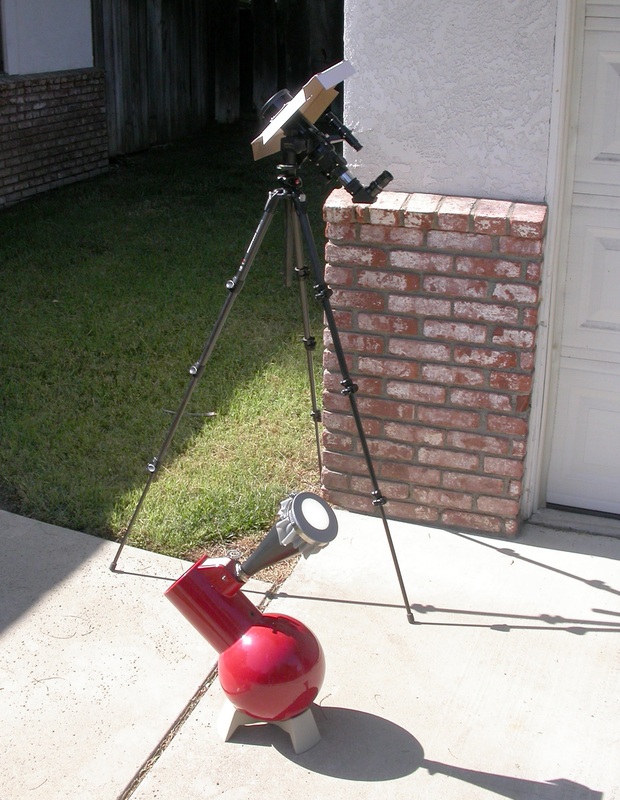 If you’re going to observe the sun with a telescope, cultivate the same habits of awareness and deliberate action that you would use around loaded firearms and power saws. Oh, the included 45-degree prism diagonal is also rubbish and the light tripod looks pretty dodgy. 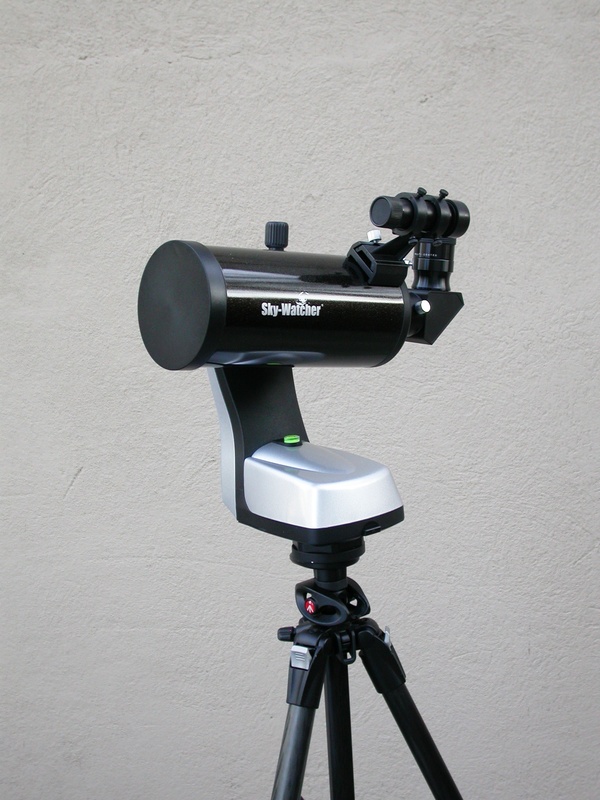 Today I used my standard small-scope setup–an AstroTech 90-degree dielectric star diagonal and a Universal Astronomics DwarfStar alt-az head on a Bogen/Manfrotto tripod–and I’ll doubtless do the same in the future. The other design thing was the sun shield. At first I tried going without but look into a dark eyepiece to catch a filtered (= comparatively dim) view of the filtered sun while unfiltered sunlight was hitting the top of my head and my upper eyelid had me squinting and developing a minor headache almost immediately. The plastic dewshield on this scope pulls right off, so I got a handy piece of cardboard (part of the packaging of a picture frame), cut a hole just big enough to admit the front end of the scope without the dewshield, slid the cardboard sunshield on and used the plastic dew shield (and dust cap with solar filter) to hold it in place. I also cut a second, smaller hole to let light in to my sight tube sun finder. 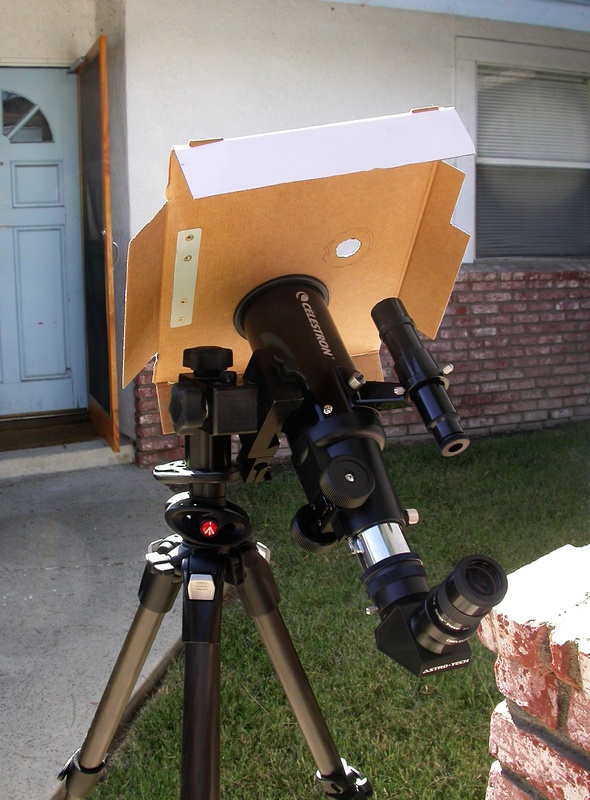 If you do something similar, make sure that the sun shield can’t get blown off and take the solar filter with it. In my case, the dewshield slides on a long way and grips both the sun shield and telescope tube firmly; a strong enough breeze might upend the whole setup, but it couldn’t blow off just the shield and filter. Again, eye safety is paramount; don’t take any chances. Okay, so how did it work in practice? Pretty darned well. I had already aligned the sight tube with the telescope, so all I had to do was rotate the sun shield a bit to make sure the second, smaller hole lined up with the sight tube. Then I could point the scope roughly at the sun and pan around until a perfectly round beam of sunlight (projected on my hand) emerged from the sight tube. That always put the sun in the field of view of a 25mm Plossl (16x, 3 degree true field of view). The view of the sun at the eyepiece was reasonably bright–for an astronomical object, not compared to the unfiltered sunlight streaming down all around–and razor-sharp. The sunspots with their umbrae (dark centers) and penumbrae (lighter borders) were striking, like they’d been etched on stained glass. Happily, the filtered scope yielded nice, even light all over the surface of the sun, no matter where it roamed in the field of the view. My one beef with the sun funnel is that it can be hard to get really good photos because of the inherent granularity of the screen material. 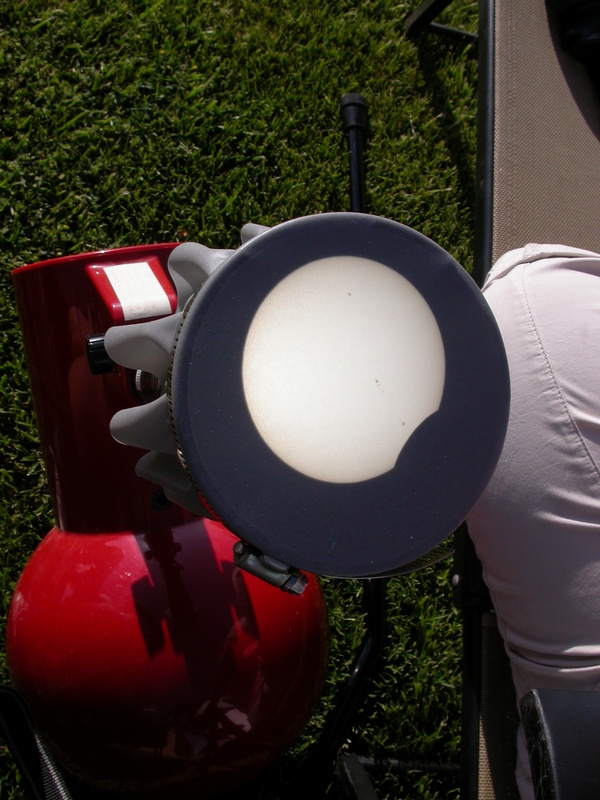 Inevitably some part of the projected sun is brighter than another, and if you manage to get the light perfectly centered, it can easily wipe out the sunspots. The best way I’ve found to avoid this flashlight-beam effect is to photograph the sun from a bit to the side, out of the direct path of the projected light (that’s how I got this very sharp photo), but then the sun is out of round–not ideal if you’re hoping to combine images into a composite or movie, or even get a nice, square-on shot of a circular sun. 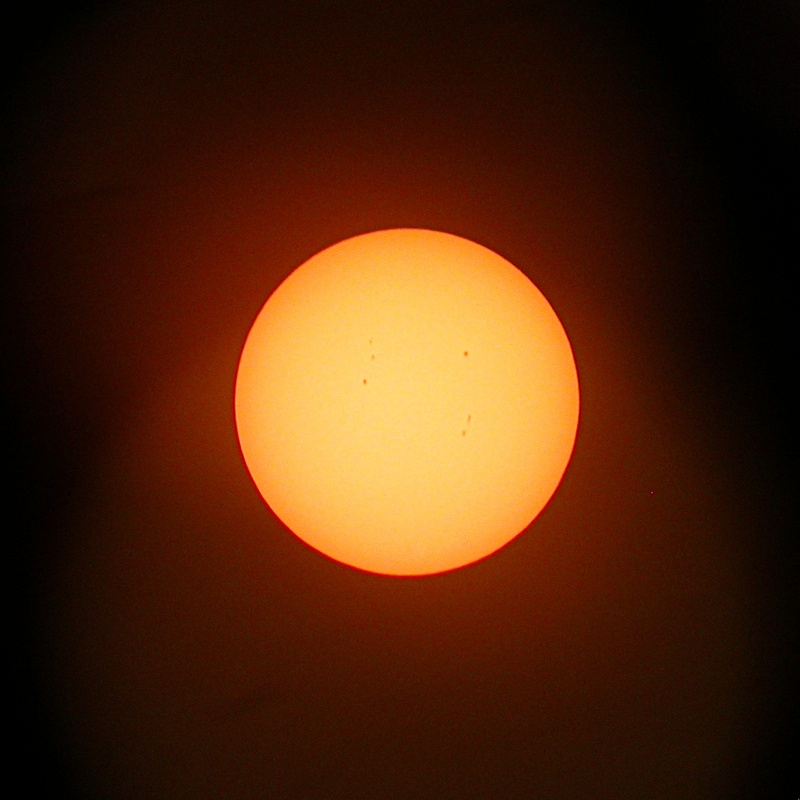 For example, in the photo above the sunspots on the left are sharp enough–the big one even shows the umbra and penumbra clearly–but the dimmer two on the right are lost in the flashlight glow of the sun lighting up the screen material from behind. And in this view the sun is already way out of round. Also note that this image is flipped horizontally compared with the image from the refractor. In fact, this image is correctly oriented. Normally Newtonian reflectors show things rotated by 180 degrees, but projecting the image on the screen undoes that and gets everything back to normal. 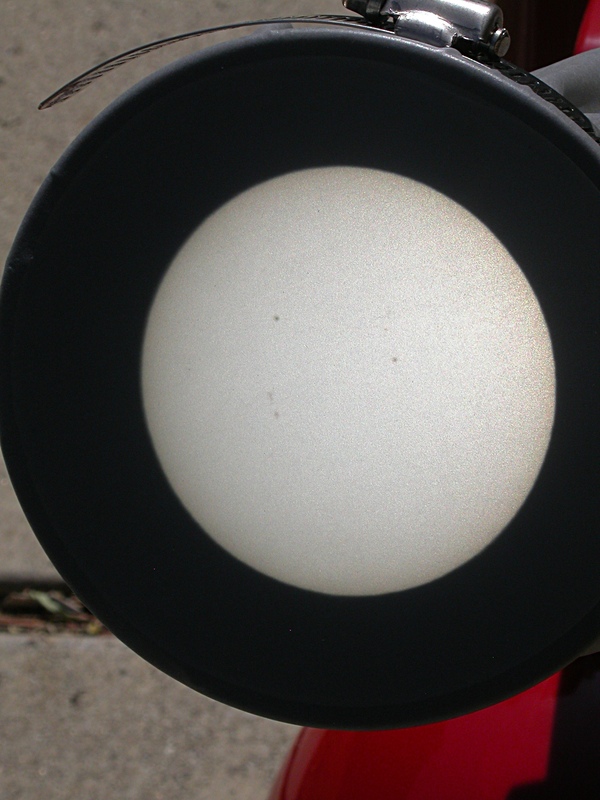 The solar filter on the refractor just cuts down the intensity of the light, it does nothing to reorient the image, so the image at the eyepiece is right side up but, because of the 90-degree mirror, flipped left-to-right. I didn’t go to all of this trouble just for the transit of Venus. I mean, I happily would have, had the transit been the only game in town. 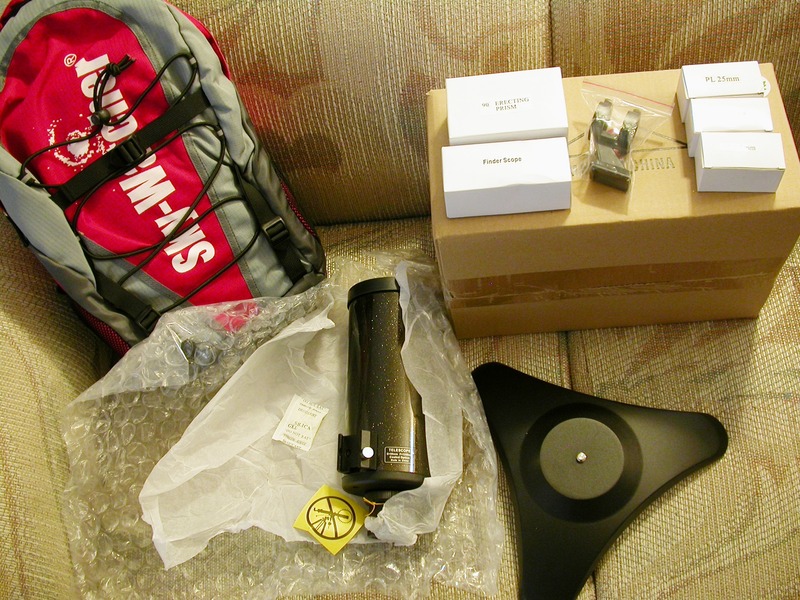 But it’s not–the Astronomical League has a Sunspotters observing program, and now that I have the gear for solar observing, I might as well start logging. I’ll keep you posted on that. Now, I should point out that the flashlight-beam effect washing out the sunspots in the sun funnel is mostly a photographic concern. For visual appreciation, even solo, I think the sun funnel still wins. A 4-inch image scale and the ability to put your head and eyes wherever you want–and even wear polarized sunglasses to observe–can’t be beat. But for photography, I prefer the filtered direct view–even in a one-inch scope. 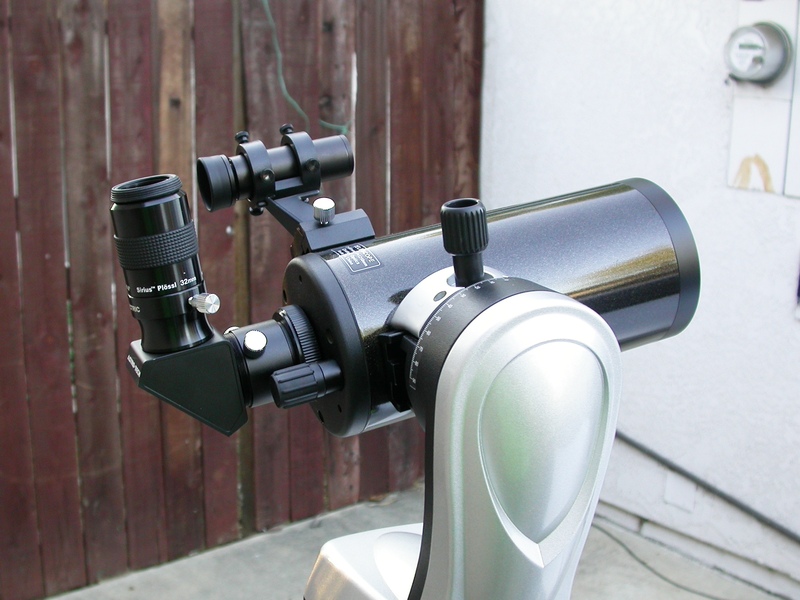 More pictures of the SkyWatcher 90mm Backpacker Mak-Cass. 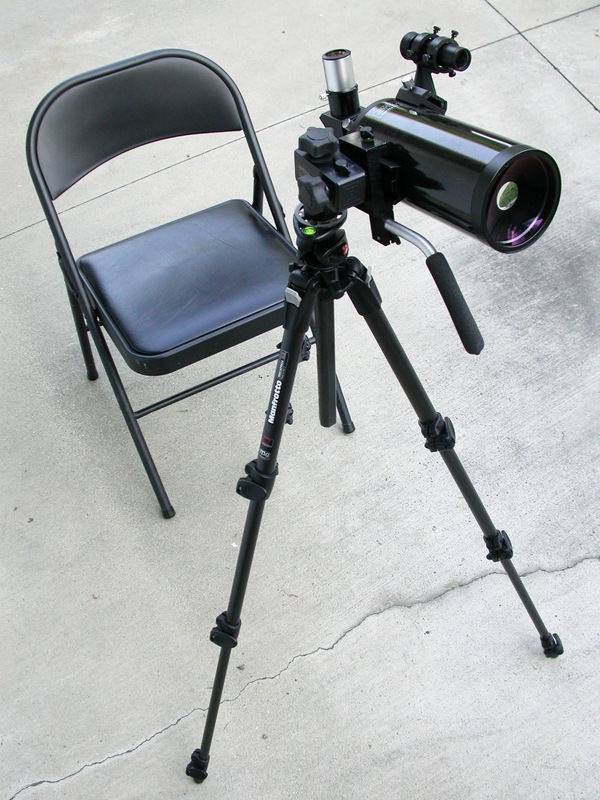 Yesterday I took the multi-mount off its tabletop base and put it on my Manfrotto tripod for some digiscoping. I was using it without the power on, as a manually-aimed alt-az mount. Another of those down-the-tube shots showing the optics. The point of this photo is different, though. Check out the knurled knob on the left that tightens the dovetail. Usually these just have a fat set-screw that goes straight onto the scope’s dovetail bar, and tightening that screw puts a tiny dent or ‘bite’ into the dovetail bar. On this mount, though, the set-screw bypasses the scope’s dovetail bar, and turning the hand knob tightens a broad metal clamp (the silver bit just underneath the hand knob in the above photo) that grips the dovetail bar along its entire length. So the scope is held more securely, and there’s no bite mark on the dovetail bar. Very nifty–I wish more mounts had this. The big news about using the mount manually is simply that it can be used that way. You don’t want to manually aim the scope once the power is on, or you risk damaging the gears inside the mount, but as long as the power is off you can just grab the tube and point. A close-up of the back end showing, from left to right, the Astro-Tech dielectric diagonal and 32mm Plossl I was using for birding, the six-screw mount for the little 8×20 optical finder, and the dovetail clamp and adjacent latitude/altitude scale on the mount. Getting lined up on a distant bird using the optical finderscope. 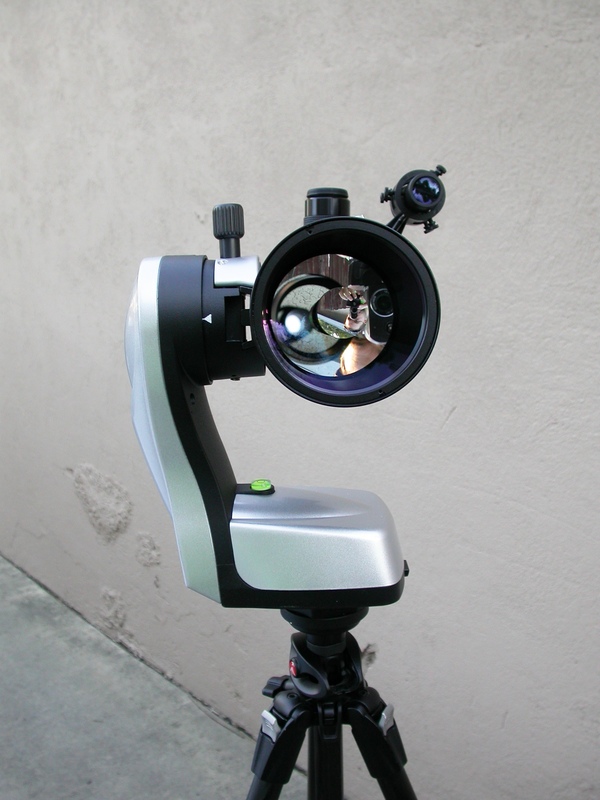 Imagine that the mount was sitting on its tabletop base and that you were trying to find something high in the sky–eventually there is just no room to get your head behind the eyepiece of the finder. That’s why I strongly prefer RACI–right angle, correct image–finders, which orient the finder eyepiece in the same direction as the telescope eyepiece, so you can look down and in from above. Waiting for the fall of night. My two best shots of Jupiter with the little Mak. I could see about half a dozen distinct cloud bands at the eyepiece, and for once the photos bear that out. As usual, however, I could still see more detail at the eyepiece than the camera captured. The views are not as good as through the Apex 127–compare to the Jupiter photo here–but they’re not that far behind. 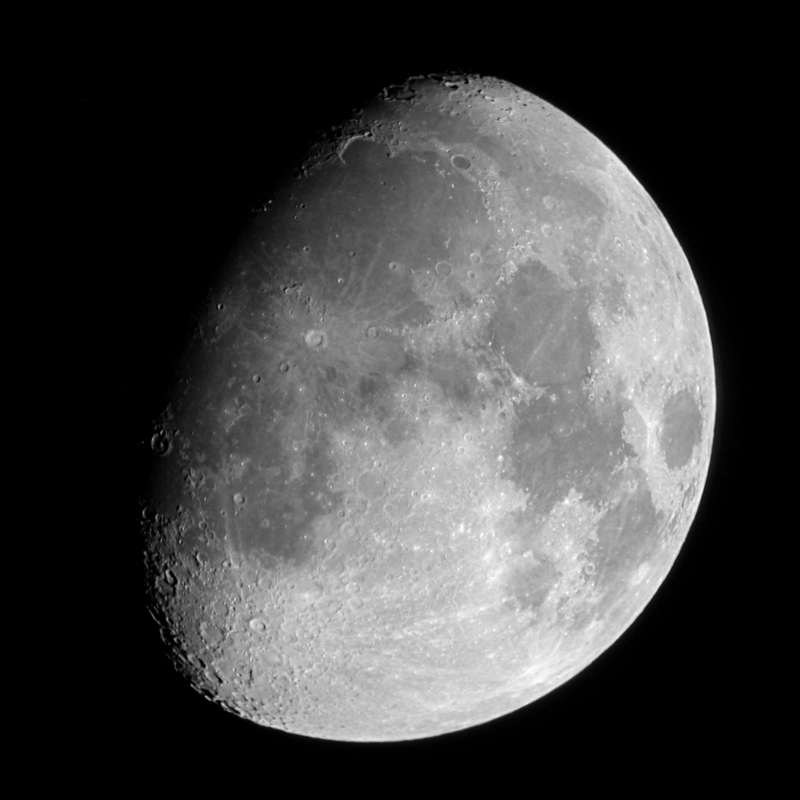 The waxing gibbous moon, again with the little Mak. This is probably the sharpest moon photo I’ve ever gotten with a 90mm Mak. 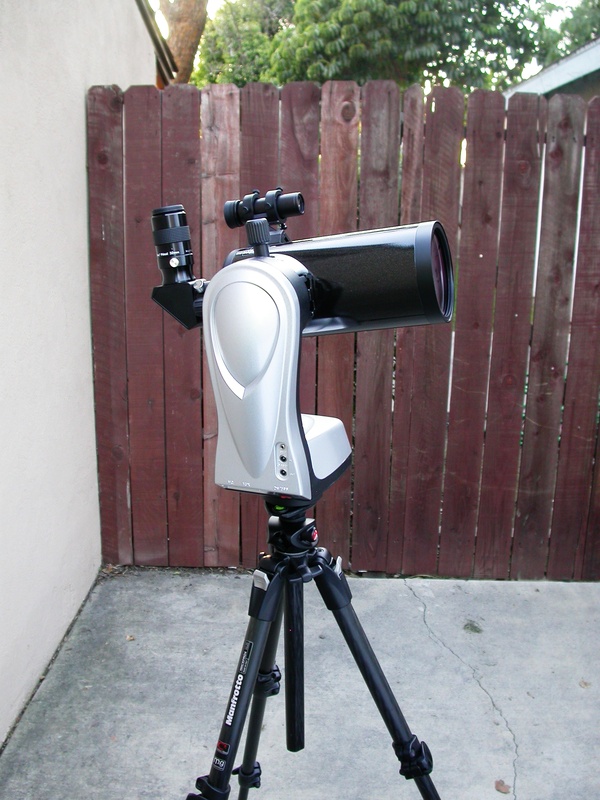 This SkyWatcher scope is at least as good, optically, as the Orion Apex 90 I used to have. I don’t know yet if it’s as good as the Celestron C90, which has gotten stupid-good reviews, but I don’t think it will disappoint anyone. Last night the sky was still enough that I could run it up to 200x and the view was still razor-sharp. That’s 57x per inch of aperture, compared to the rough rule of thumb of 50x/inch in a good scope, so this little scope is punching above its weight. I haven’t tried to max out the magnification to see where it breaks down, but I think it will probably be quite a bit higher. The fact that the meniscus is merely coated instead of multi-coated has not impaired the scope’s performance as far as I can tell. Possibly the few percent difference in light transmission will be noticeable when one can switch back and forth between this scope and one with a multi-coated meniscus; it is certainly not noticeable when using the scope on its own. I still haven’t had time to try out the tracking function on the mount, but this afternoon I did put batteries in and slewed it around and didn’t have any problems. I’ll report back when I’ve had it out tracking under the stars. Fate smiled on me yesterday and early this morning, and I was able to get some pictures with the SkyWatcher 90 mm Backpacker. If you’re impatient you can scroll to the bottom of the post for the photos. I should stop here and say that I ultimately intend to test the whole kit–scope, mount, and accessories–as a system, because whether you use it as-is or mix-and-match components, it is sold as a system and is at least theoretically supposed to function as one. However, between teaching, taking a statistics class, and wrangling ostriches, I just haven’t had time to mess with the mount. My primary concern has been to assess the optical quality of the scope–and now I actually have some information. I got in a brief observing session between responsibilities yesterday afternoon. I was plinking around the yard, looking at birds. For these observations I started out using the included 90-degree prism diagonal and 25mm Plossl eyepiece. I first looked at a couple of obvious birds silhouetted against the sky in treetops, and they looked fine. Then I went after one hidden in the leaves and branches of one of my neighbor’s trees, and in those dimmer conditions I noticed something unnerving: the eyepiece view was very soft and didn’t snap to focus, as if I was observing with a very short focal ratio scope like an Astroscan. Also, there was some ghosting of the image in the eyepiece, and the edge of the image was poorly defined. In short, it was very, very different from the crisp, sharp, detailed images that Maks are renowned for, and not in a good way. I was just having a “Hey, what the–!” moment when I remembered where I had seen these kinds of problems before: in scopes using cheap prism diagonals instead of mirrors. Without moving the scope, I went to the garage and pulled the Astro-Tech dielectric diagonal off my Apex 127, and swapped that out for the prism diagonal. I held my breath as I put my eye back to the eyepiece–were the problems all in the diagonal, or had I gotten a lemon of a scope? Sweet relief–even in the dim light amongst the leaves and branches, the view was razor-sharp and contrasty. It was like someone had run a very good image-sharpening algorithm on the eyepiece view. Suddenly details that were invisible before were popping out all over the place. Leaves that had been too fuzzy to invite close inspection were etched with delicate networks of veins. The whole view just looked more real. I decided then that I would try to find out just how good or bad the prism diagonal is, and under what conditions. After that quick peek I didn’t get another chance to use the scope until about 10:00 last night. 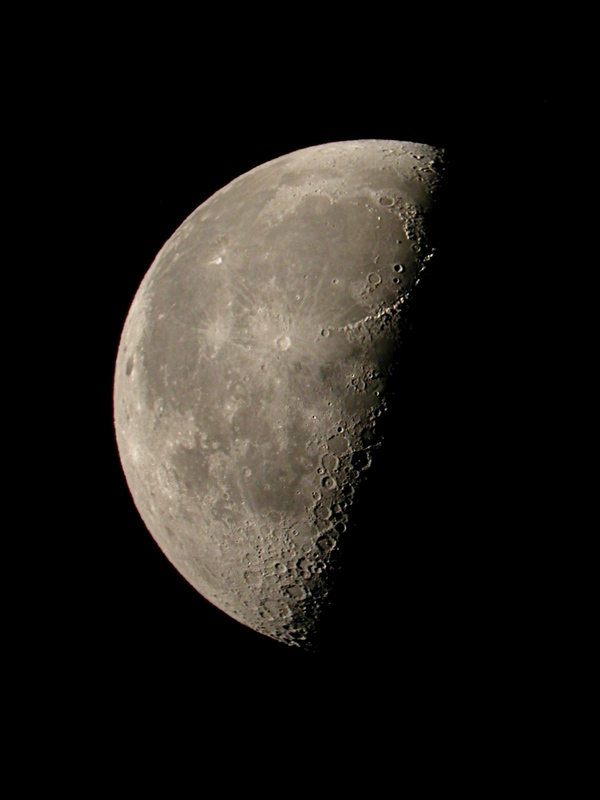 The first quarter moon was still fairly high in the west, but the seeing was not good. The air just roiled over the moon, and every star I looked at scintillated with fast-moving rays of light. Not good conditions for testing a new telescope, because it’s hard to push the magnification up and tell if the results you’re getting are because of the scope, the seeing, or both. But I went ahead and put the scope through it’s paces anyway. The thing about seeing is that from time to time it does settle down a bit, at least momentarily, and in those instants the amount of additional detail that is visible is sometimes shocking. So the longer you look and the more patiently you observe, the more likely you are to catch those rare moments of steadier air and see something really remarkable. For eyepieces I used a 32mm Sirius Plossl from Orion and the 12.5mm and 6.3mm SkyWatcher Plossls that came with the scope. I took all of the pictures in this post afocally with a Nikon Coolpix 4500 hand-held to the 32mm Plossl, and with the camera optically zoomed enough to eliminate any vignetting. The moon looked surprisingly good with the Astro-Tech diagonal in place. It was fairly swimming in the turbulent air, as if being viewed under a thin stream of moving water. But if I focused on a particular crater or feature for the space of a minute or two I would catch a patch of calmer air and see perhaps double the detail in those brief glimpses. Small craters that were otherwise just spots would pop into focus with dark rims and bright floors. The 12.5mm eyepiece had tighter eye relief than I am used to in that focal length; I have long-ish eyelashes and they were occasionally brushing the eye lens, something I don’t remember ever happening with the 12mm SkyWatcher Plossl that I got with Shorty Long, my 80mm f/11 achromat. That 12mm looks identical to the Orion Sirius line, whereas the eyepieces that came with the Backpacker have smooth silver barrels and no rubber eyecups, so even though they are both branded SkyWatcher they might have somewhat different guts. Also, I’ll have to look more closely the next time I’m out, but the 12mm felt like it had a narrower apparent field of view than the 32mm, which shouldn’t be possible if they are both Plossls, which typically yield a 52-degree apparent field. Could be that the short eye relief was playing tricks on my perceptions. Anyway, with the 12.5mm EP in the scope was working at 100x and I was still seeing plenty of few detail in the still moments. I put the 6.3mm EP in just for the heck of it. I wasn’t expecting much, both because of the punk seeing and because that magnification–200x–ought to be pushing on the edge of what this scope can do. A commonly used rule of thumb is that a good scope should be able to handle 50x per inch of aperture. At 3.5 inches, any of these 90mm Maks ought to be good up to at least 175x. But I have to point out that the 50x/inch “rule” is often broken and not only by premium scopes. David DeLano has had his 114mm reflector up to 400x (89x per inch), and the other night I took my Apex 127 to 514x (103x) to split a close double star that was not split at 257x. I’ll just note that those are both relatively long focal ratio scopes, about f/8 for David’s reflector and f/12 for the Apex, and maybe that has something to do with it; such gently-tapering light cones are certainly easier on eyepieces and so on. Anyway, at 200x with the 6.3mm EP I was still getting glimpses of considerable detail. I can’t say for certain because of the lousy seeing, but I think this scope can handle 200x. I hope I get a still night soon to test that. Okay, so far so good with the Astro-Tech diagonal. I swapped it out for the stock prism diagonal and went back to the 32mm Plossl. YUCK! I almost could not focus my eye on the moon, because there was a moon-sized ghost image floating around in the field of view that looked like it was probably some kind of reflection of the primary mirror or maybe even the corrector. It was a big white donut with a dark hole in the middle, anyway. I’ll stress that this ghost image or whatever it was was not there with the Astro-Tech diagonal. I have never seen anything quite like it before, and given the controlled conditions of time, place, observer, scope, and eyepiece, I feel confident blaming the prism diagonal. I tried the two other eyepieces. The ghost didn’t show up in either of them. The 12.5mm was merely okay, producing a slightly softer view in the prism diagonal than in the Astro-Tech. The 6.3mm was very noticeably softer; this time going from 100x to 200x looked and felt like empty magnification. I also looked at Belelgeuse and Mars with all combinations of diagonals and eyepieces. Betelgeuse was sparkling in the Astro-Tech diagonal, but at least the scintillating rays of light were sharp. In the prism diagonal it was a fuzzy mess. Betelgeuse was down near the horizon, though, and Mars was very high, so I hoped to see at least some detail on good old Barsoom. Mars really required the 12.5mm EP; at 39x it was a bright orange BB, too small to see detail on, and at 200x it was a big orange smudge. At 100x with the prism diagonal I could only suspect the polar cap, and that might have been because I knew it was there to be seen. I had started that run with the Astro-Tech, and in steadier moments the polar cap was a well-defined white patch with a hair-fine black border. In brief flashes I also saw dark markings on the face of the planet’s disk. So despite the lousy seeing, the little scope lived up to the Maksutov reputation as a fine planetary instrument. 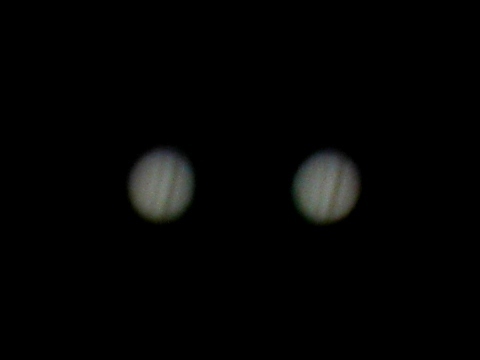 I did see some off-axis glare from Betelgeuse and Mars, but only in the 32mm Plossl. I am going to do some more testing to see if that is a scope issue or, as I suspect, an eyepiece issue. 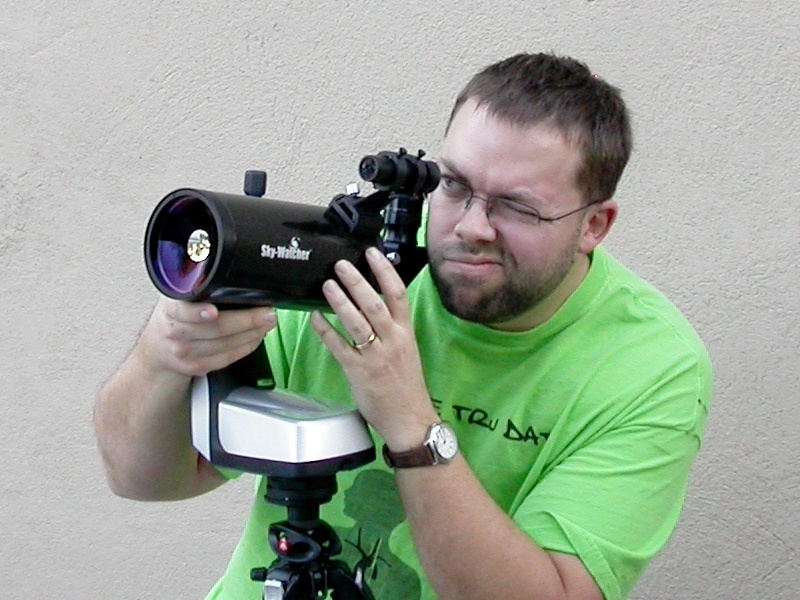 Also, getting the scope on target using the 8×20 straight-through finder was not difficult but it was uncomfortable, and usually required me to move my chair, squat behind the scope, and go back and forth between sighting down the tube and squinting through the finder. It’s doable, it’s just not fun, and something like a 6×30 RACI should be a high-priority upgrade if you get one of these. This morning before work I got some photos of neighborhood birds, using both the Astro-Tech dielectric diagonal and the prism diagonal that came with the scope. Be aware that that both my camera and my photographic method are primitive. The camera is a 4-megapixel job more than a decade old now, and while its rotating barrel design is convenient for digiscoping, it just can’t keep up with the better modern cameras. Also, hand-holding the camera to the eyepiece means that I’m usually the most mobile link in the system, so any fuzz or blurring in the photos is possibly caused by my minuscule shakes rather than by the optics. To try to eliminate that factor as best I could, I took several exposures of each target and picked the sharpest from each set for the comparison images. In all of the comparisons between diagonals, the photo through the prism is on the left, and the dielectric photo is on the right. Other than having been put into the same image for comparative purposes, the photos are completely unprocessed: no sharpening, no levels or curves, no rotation, and I didn’t even flip the photos through the star diagonal, which are reversed left-to-right. Click each image for the original, full-resolution version. The moon last night. The view through the dielectric diagonal was markedly sharper and more contrasty, and these unprocessed photos, taken just minutes apart, bear that out. The full-resolution dielectric photo shows a very thin line of purple chromatic aberration around the limb of the moon, but I couldn’t see it at the eyepiece despite being on the lookout for it. This fellow was sitting a tree that I have paced out at about 70 yards from my driveway. Again, the dielectric photo (right) has better contrast, and look at the difference in the color of the background sky. This is the same bird and I took the photos about 2 minutes apart. This dove was quite a bit farther way. I haven’t paced it out, but this powerline must be well over 100 yards from my driveway. Notice the scale of the bird in the photos and the pronounced drop-off in detail compared to the little songbird above. Detail is probably a wash here, but the dielectric photo has better contrast and again the background sky is more blue. One more point to make is that I hardly ever post raw images. Almost every photo can benefit from a little processing with Unsharp Mask and Curves (I use GIMP, which is free–see details on what I do to each photo in this post). 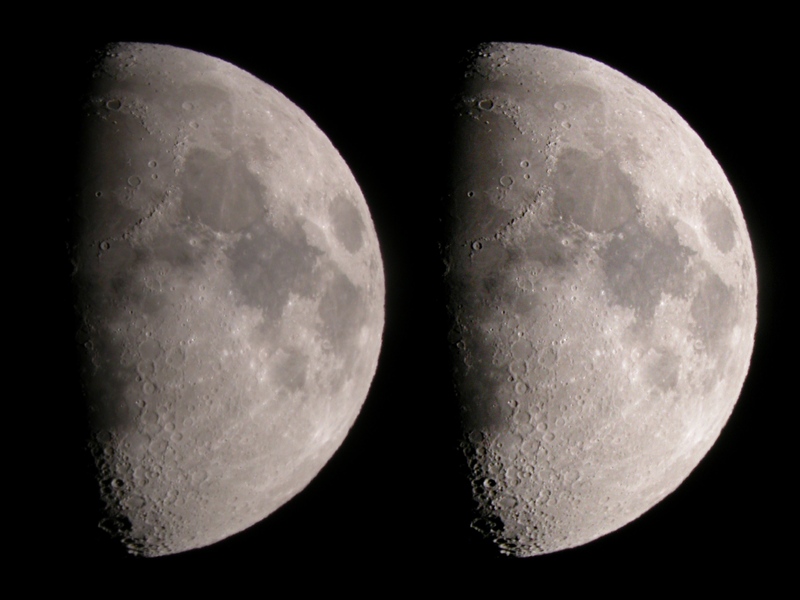 Here are the best dielectric photos of the moon and the songbird, with the unprocessed photo on the left and the lightly processed version on the right (this time I did rotate the moon and flip it to its correct side). So, what did I learn from all of this? The SkyWatcher 90 Backpacker is a decent little scope. I couldn’t see any optical problems, and I was impressed to see details on Mars at 100x with the included 12.mm Plossl and the Astro-Tech diagonal. Views of birds are as good as those I used to get with my Orion Apex 90. But the supplied diagonal is not good, and really limits the views the telescope is capable of providing. If you get one, replacing the diagonal with even an inexpensive mirror diagonal should be a top priority. Let me put in a plug here for the Astro-Tech dielectric diagonal. It consistently throws up a great image–it’s the diagonal I used when taking the Apex 127 to 514x for that double star split–but at $69.95 for the 1.25″ version it is no more expensive than some ‘entry-level’ mirror diagonals. The supplied prism diagonal does have one potential use: if you have an old binocular laying around, you can disassemble it and use one of the objective lenses to make a proper finderscope, and if you include the diagonal it could even be a RACI. Mounting a bigger homemade finder to the scope will take some ingenuity, but I figure anyone who likes to tinker enough to build a finder in the first place can be trusted to come up with a mount as well. So I now feel confident enough to recommend the scope, at least, although the mount is still a question mark and the diagonal and finder are troublesome (as expected). I don’t know how the scope performs compared to the Celestron C90, which is also on sale, because I haven’t had the chance to test them side-by-side. But with a little luck I may get that chance soon. Hopefully this weekend I’ll have time to get the mount up and running. Stay tuned. 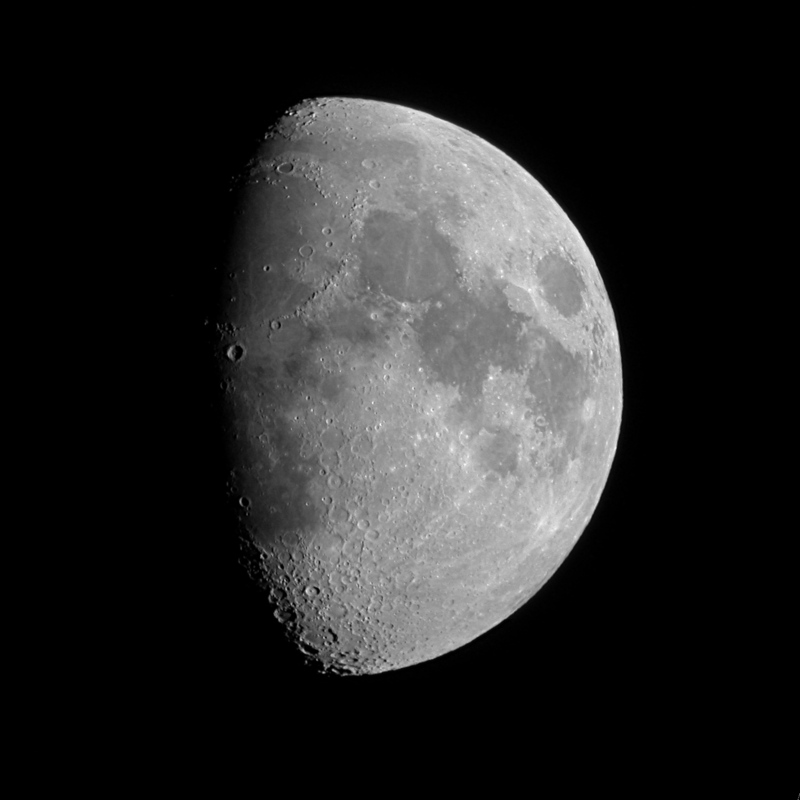 The moon last night, at last quarter. I love this phase because the mountains that form the eastern rim of Mare Imbrium–the immense incomplete circle in the moon’s northern hemisphere–are still catching the light of the setting sun, creating an arc of light in a sea of darkness. Galileo saw the same thing with his 1-inch telescope 403 years ago, and correctly inferred that the lights in the darkness were mountaintops on the moon, catching either the first (when waxing) or last (when waning) rays of the sun, and that therefore the moon was not a perfectly smooth sphere, but a world with similarities to our own. And, hey, it looks pretty. I like how the arc-of-light-in-darkness motif is repeated by the smaller craters along the terminator to the south of Mare Imbrium. 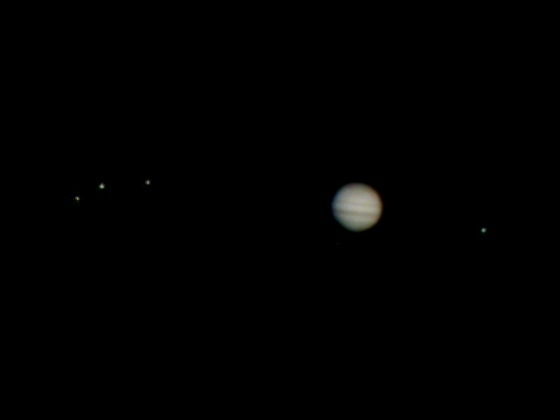 Jupiter and the Galilean moons, tonight. As with previous efforts (see here and here), this is a composite shot. 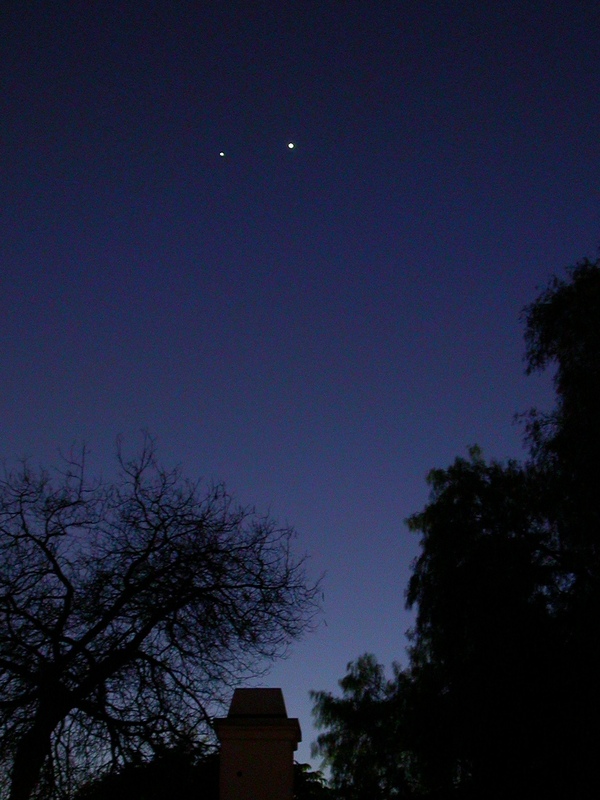 To get the moons to show up at all, I had to completely overexpose Jupiter, so this is a combination of two images. The order of the moons from right to left is also, by chance tonight, their order from closest in to farthest out from Jupiter: Io (by itself on the right), Europa, Ganymede, and Callisto. This is only the second time I’ve gotten Jupiter and all four kids in one shot; often one of the little bleepers is off in Jupiter’s shadow. All photos taken with a Nikon Coolpix 4500 digital camera, Orion Apex 127mm Maksutov-Cassegrain telescope, and Orion Sirius Plossl eyepieces (32 mm for moon, 25 mm for Jupiter and family). 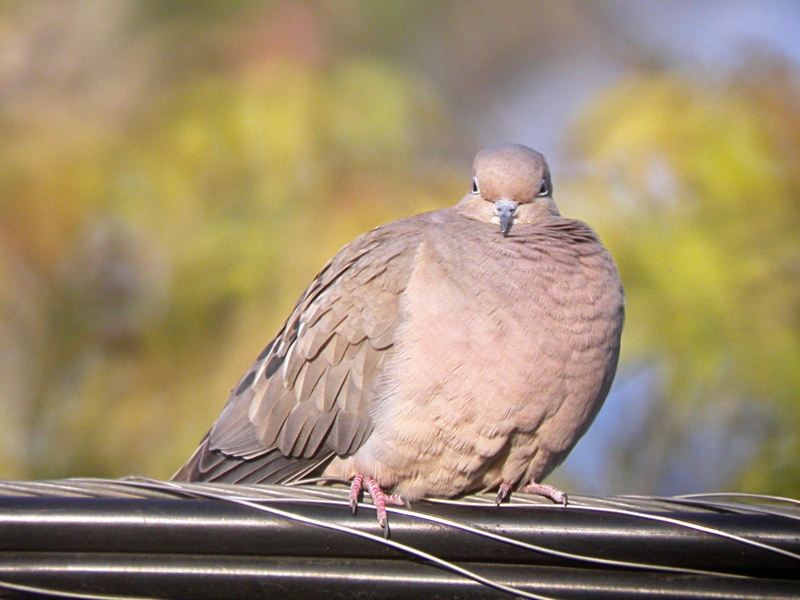 You are currently browsing the archives for the Digiscoping category.